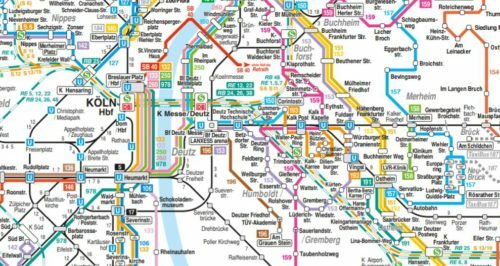 The latest (2019) bus map and rail map for Cologne (Köln in German) can be viewed and downloaded as pdfs on the website of the local public transport operator, KVB. Select the map image below to go there.Then scroll down to the bottom of the KVB page to find the map or maps that you want. Download and zoom in as required. There’s a train station inside the airport, and getting from there to Cologne central station takes just 10 minutes on the train. There’s a good bus service to the city too. Köln is the city’s correct name in German; Koeln is an acceptable spelling if you can’t type the umlaut (two dots) over the o. Cologne is the French and English name for it. Some other alternatives are Colonia (Italian and Spanish), Keulen (Afrikaans and Dutch), Kèlóng 科隆 (Chinese), Kerun – ケルン (Japanese), Kjol’n – Кёльн (Russian), Koelleun / K’oellŭn – 쾰른 (Korean), Kolín nad Rýnem (Czech), Køln (Danish and Norwegian), K’oln – Кьолн (Bulgarian), Kolonía – Κολωνία (Greek), Kūlūniya – كولوني (Arabic),.